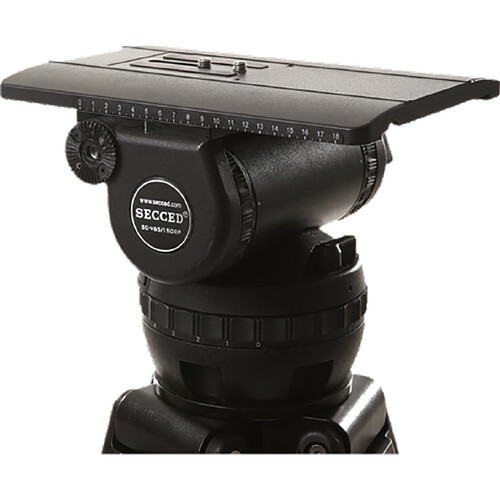 The SC-V65/150RP Fluid Head from SECCED can equip 25 to 65kg payload range that provides support for EFP, OB, and Studio application. Its improved drag system enhances the smoothness of the head movement, matching the quality of big brands. It offers tilt and pan drag adjustment. The featured step-type counterbalance system helps operator to balance the camera to quickly find the right amount. Furthermore, the quick-release mechanism allows you to quickly mount or dismount the camera on the head. All main parts are made with high quality CNC machining. It ensures high reliability and improves fluid head performance. In order to enhance rigidity of plastic parts, high quality hard plastic is adopted to manufacture all plastic parts of fluid heads, especially the control elements (brake level, clamp level, and more). This 150mm ball head is compatible with most 150mm tripods.